Arthur Wyndham Playfair was an actor and singer. He appeared in a couple of William Schwenck Gilbert’s operas, as well as Edwardian musical comedies, and also created roles in Victorian burlesques. Born on the 20th October in 1869, Playfair started life in Ellichpur, a city in the Indian state of Maharashtra. He made his first appearance on the British stage in December of 1887. He started out in Victorian burlesque, creating his first notable role in Cinder Ellen up too Late, in 1892. The show was based on the pantomime and fairy tale, Cinderella. Although it originally debuted in the Gaiety Theatre on 24th December 1891, it ran until 9th July 1892. During that time, it was rewritten, with some cast being replaced and new roles being created. Playfair’s next role was in a two-part comedy opera, entitled The Mountebanks, it was written by Alfred Cellier and W.S. Gilbert. First performed at the Lyric Theatre on 4th January 1892, it had an initial run of 229 performances – ending in August 1892. Playfair had the role of Giorgio Raviolo, a baritone member of the band. In 1894 Playfair teamed up with Jessie Bond, in the musical comedy Go-Bang. Produced by Fred Harris, it opened at the Trafalgar Square Theatre on the 10th March 1894. Playfair played the part of Sir Reddan Tapeleigh, whilst Bond played the part of his daughter, Helen. The following year, Playfair took part in W.S. 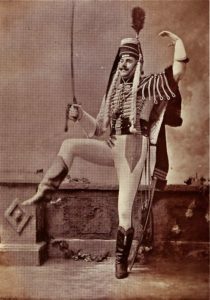 Gilbert and F. Omond Carr’s His Excellency, with the role of Harold, Corporal of the King’s Hussars. He affectionately became known as the dancing corporal for this part. 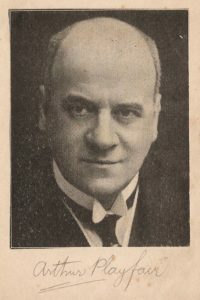 During 1901 to 1904, Playfair toured America, appearing in The Man from Blankley’s at the Criterion Theatre, followed by a role as Bernard Mandeville in Letty. In 1896 Playfair married actress Lena Ashwell OBE. Their marriage lasted until 1903, when he issued divorce proceedings, following her adultery with Broadway actor Robert Taber. They finally divorced in 1908. It wasn’t until 1911 that Playfair had his first starring role in Preserving Mr Panmure, followed by another staring role as Baron Dauvray in The Girl in The Taxi. The musical opened at the Lyric Theatre on the 5th September 1912 and ran for 385 performances. It was subsequently made into an American film in 1921, followed by a British one in 1937. Playfair appeared in a series of hit revues during World War I, including The Passing Show, Bric-a-Brac and Vanity Fair at the Palace Theatre, London. He then went onto take a part in a silent film (Judged by Appearances (1916)) before a couple more successes in the Comedy Theatre, London, during 1917-1918. Arthur Wyndham Playfair died in Brighton, on the 28th of August 1918. He was 48.